Troubleshooting Centrifugal Pumps and Their Systems, Second Edition, begins by discussing pump characteristics that can be reconfigured to suit changing conditions. Next, it provides guidance on when to withdraw a pump from service for repair and how it should be subsequently treated. 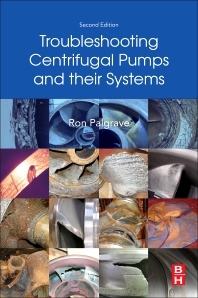 It is an ideal resource for those who feel ill-equipped to analyze unsatisfactory pump system behavior, and is also a great reference for pump engineers, pump hydraulic designers, and graduate students who need systemic knowledge on centrifugal pumps and their systems. 5. Does the Pump Need to Start Yet? 6. Are Conditions Satisfactory for Start-Up? 8. Has Pumped Started Satisfactorily? 9. Does the Pump Continue to Operate Well? 10. Does the Pump Need to Stop Yet? 12. Has Pump Stopped Correctly? Ron Palgrave is a pump designer with more than 50 years’ experience in most areas of application. Specialist in the hydraulic design and performance of centrifugal pumps. Author of several technical paper and magazine articles. Granted several patents relating to pump technology. Still practicing part-time and one of the most experienced engineers in the industry.